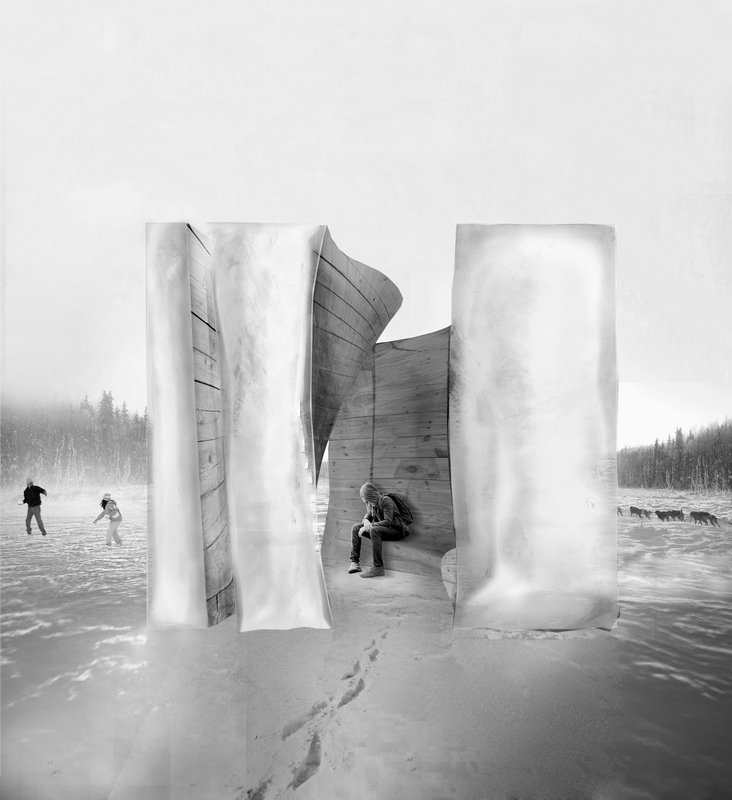 « Warming Hut » is an ephemeral space of contrasts blurring the limits between shelter and installation encouraging the visitor to engage and interact with the space. A human intervention that merges with the landscape while provoking the sensory experience of the visitor. A frozen cubic shape, rigid and acute on the exterior, while the interior space made of wood, fetching and inviting, allures the visitor to follow its curvatures and engage through their body with the warmth and fluidity of the space. Ice crack inspired voids of different intensities, and alternations of scale offer a variety of spatial conditions provoking different moods to the visitors. The body bends, turns, attempts to fit through narrow slits. The space is the human body’s continuation, offering the exhalation of reaching the so-desired comfort at the end of the tunnel. The shell, all made of ice, is formed by pouring water into a mould, reminding of an ice-cube. The curved timber core is constructed from milled White Spruce beams and creates a protected and cosy environment which includes canals leading to a gathering space with a small seating area.